Sometimes you come across a story or an event that really resonates with you. There is something about someone who comes across honest and vulnerable. Andie Mitchell, author of the cookbook, “Eating in the Middle” is one of those people. In her introduction she talks about weight loss and how she lost 135 pounds 10 years ago. Since then she has kept the weight off but also had to deal with the emotional side of her relationship with food. She turned that relationship into a positive one by experimenting in the kitchen, and so began her trials and tribulations. The recipes that you will see in this cookbook are mainly a balance between wholesome and healthy with a little sweetness sprinkled in. What I enjoyed most was the way she lightened up the classics. I baked the banana nut donuts and loved the cream cheese frosting with maple syrup, vanilla and cinnamon, it was perfection. I practiced my own self-control by preparing only half of the recipe and only frosting part of the donuts, both ways were delicious. Donuts are a serious weakness of mine! Banana nut with cream cheese frosting sounds fantastic. Thanks Lisa, the frosting was wonderful, perfect accompaniment for the donut. Hi Tandy, so do I, very realistic. Take care. Sounds like a book worth checking. Hi Amalia, it's a great cookbook, most of the recipes are simple without tons of different ingredients. Sounds like a great book and she is obviously "proof of the pudding"! Hi Chris, oh I love that saying, but yes she walks the walk. This sounds like my kind of book. It's so important to have a healthy relationship with food. Hi Dannii, definitely.....I think that is the key. Thanks Dena, still working on the self control. Hi Grace, so do I, you could feel the vulnerability of the author in this cookbook, it was very refreshing. This just reminds me that I haven't had a baked donut in AGES!! Yours look fantastic! Thanks Angie, donuts are always fun to bake. Thanks Agness, donuts are good. Thanks Liz, it is a great cookbook. Have a great week-end! 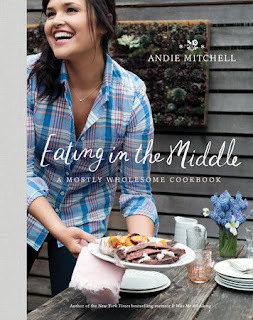 I have loved Andie's blog for a long time, and I'm waiting for my copy of the book to show up any day now! Thanks for the review, and I can't wait to make a batch of those donuts! Hi Amy, Andie's blog is beautifully done and I really enjoyed her book. Take care. Sounds like a book I would like to own and read. The doughnuts sound delicious and good for her losing the weight, keeping it off and her book will inspire others to do the same. Hi Suzanne, it is a wonderful book and she is a great inspiration. Wow! Donut for loosing weight? Who wouldn't love that. The doughnuts sound delicious. This sounds like an awesome book, Cheri. Thanks Helene, they were delicious. Have a great week-end. Thanks Louise, just sent you an email as I am not sure how to. Your donut turned out so cute, so you only ate 6? LOL Life is really all about balance and making just some simple changes can really make a huge difference. Hi Bobbi, you are so funny, no just one but I had lots of help. Have a great week-end. These look so delicious, Cheri. Anything with banana is always on the top of my list. Great shot! I think many of us have our struggles with food but you demonstrated perfectly how it's all about moderation. I think I'd love that book. I'll have to check it out. Hi Robyn, somehow I missed this comment. Yes, it is a great book, I enjoyed reading through it, she writes beautifully. Sounds like a great book! I think our relationship with food can get really complicated. Good thing I didn't realize this in my youth but nowadays, it can be so complicated. Let's toast to good, healthy food with some treats thrown in! I'm in Monica, moderation is good. I love baked donuts and the cream cheese frosting is the perfect topper! Thanks Marcie, I love baked good too. Sounds like a book I could use! Hi David, I like the fact that she is all about moderation and not cutting out certain foods. I often think we have dieted ourselves into being fat - deprivation probably doesn't work. Love the sound of this book - I will have to check it out! Thanks - hope you're having a lovely weekend. Hi Tricia, never thought about it like that but that makes perfect sense. love the cover! and donuts look fantastic! wish i could know the recipe since I just bought a donut pan myself. Were they fried or baked? Hi Marcela, they were baked. I could not post the recipe in this review but Andie also has a website with other baked donuts on it. Here is the linkhttp://www.andiemitchell.com/2012/11/04/warm-and-spicy-baked-pumpkin-donuts/. Hope that helps. Thanks Kim, love the matcha donuts that you just posted, have not tried matcha yet, now I have a reason. Sounds like a great cookbook and a really inspiring woman. Thanks for sharing! Thanks Beth, yes, she seems like she has accomplished a lot. That's so inspiring that the author lost and kept off all that weight! It sounds like a great cookbook! Thanks Nancy, it really is. I have been seeing this cookbook around, and the title is very intriguing to me. I struggle with balance when it comes to eating. I do okay for awhile, and then when I get busy, everything seems to fall apart as far as my eating. Anyway, these donuts look so yummy! I appreciate hearing your review on this book, Cheri. Thanks so much! Hi Shari, balance is definitely something I work on as well. Very tough around the holidays. This sounds like a book that lots of people, myself included, can relate to! I will look it up on line. Thanks for the review, Cheri and those donuts look delicious! Hi Marcelle, yes, it is a great book. Cheri, what a delightful outlook on life, what a great cookbook recommendation and what a fun recipe! Thanks Andrea, yes she does have a great outlook.